Carpe Diem “Seize The Day” – A single player memorabilia card honoring amazing single game heroic achievements that set NHL records! Featuring such legends as: Maurice Richard, Mario Lemieux and Busher Jackson! Undefeatable Fabrics – A single player 3 piece memorabilia card with a prime swatch parallel version! 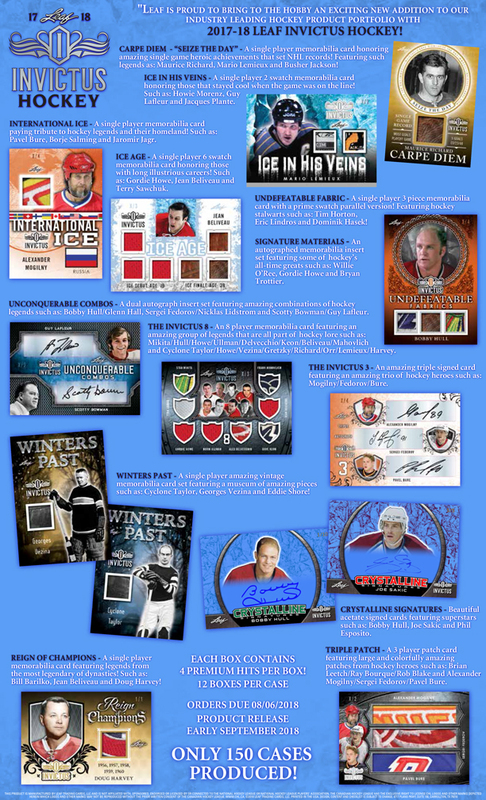 Featuring hockey stalwarts such as: Tim Horton, Eric Lindros and Dominik Hasek! The Invictus 3 – An amazing triple signed card featuring an amazing trio of hockey heroes such as: Mogilny/Fedoro /Bure. Each box contains 4 premium hits.